JandCase Full Spectrum White Light LED Grow Light Bulb, 12W Natural Plant Light for Greenhouse Gardening, Indoor Light for Vegetables, Grow Bulb for Indoor Hydroponic Plants, E26 Base by JandCase at Community Greenhouse. MPN: ZW-12W-FW-E26. Hurry! Limited time offer. Offer valid only while supplies last. 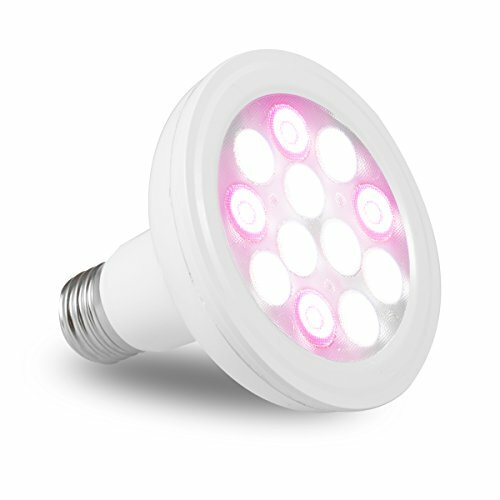 Specifications: Condition: Brand new Light Source: Full Spectrum LEDs X 4, White Light LEDs X 8 Dimensions: Diameter 3.58 in, Length 3.43 in. Dimensions: Diameter 3.58 in, Length 3.43 in. When choosing an LED grow light it is important to consider the spectrum it covers and how closely that spectrum matches the natural light. The more closely the more efficient it is. Plant growth is better under a white light, or natural light, which allows plants to grow normally. Plants grow under a full spectrum light will gain a higher dry and wet weight, and a greater leaf area than under a red and blue light. Full Spectrum is ideal for starting seeds or cuttings. It is the most energy efficient grow light available. When starting transplants indoors, give plants 12 to 14 hours of light per day. Plants are generally intolerant of continuous light for 24 hours. LED grow lights should be kept at least 12 inches (30 cm) away from plants to prevent leaf burn. Horticulture, indoor gardening, plant propagation and food production, including indoor hydroponics and aquatic plants. Natural Light is Ideal. A much closer match to the spectrum of natural light than those emitting light at a few wavelength, more beneficial to the healthy growing of indoor plants. Easy to install. Favorable for various plants and different growth stage. 1 year warranty.